The recently deceased Graham Taylor will always be remembered as the much-maligned England National Team Manager of the early 1990s. His origins in the game were unremarkable. He had a long and untypical career before reaching his zenith as England Manager. Taylor, the son of a Sports Reporter, was born on September 15, 1944 at Worksop. He played in the Third and Fourth Divisions in the 1960s. He stayed at Grimsby Town from 1963 onwards, until joining Lincoln City in 1968. It was there that he found his true calling in Football Management by being appointed as their Manager in 1972, aged just 28. This made him the youngest League Manager ever. Rock Star Elton John was impressed enough by his work at lower levels to appoint him as Manager of the Team he owned, Watford, in 1977. At the time Watford were languishing in the Fourth Division. Taylor succeeded in promoting Watford from every Division to finally get promoted to the First Division in 1982. In their first full season in top flight, they took English Football by storm by finishing as runner-up to the mighty Liverpool in the 1982/83 season. The Team featured young up and coming stars such as Striker Luther Blisset and Winger John Barnes. The rest of the squad were mostly unknown workmanlike players in Taylor’s image. They were not particularly pleasant to watch but were efficient and direct. The next season (1983/84), Taylor took his Watford squad to the Final of the FA Cup, where they lost to Everton (0-2). He left his Watford post in 1987 and took over at the newly relegated Aston Villa. Using Direct approach tactics that had served him well at Watford, he promoted Aston Villa at first attempt and rejoined the Top Division in 1988. He signed a then-unknown David Platt and launched his career in the top flight. Taylor and Platt were instrumental in Aston Villa’s challenge for the First Division title in the 1989/90 season. Taylor, once again, managed a creditable runner-up spot to a stronger Liverpool side. Once again he was praised for improving the fortunes of his side and introducing many new players such as Platt and Tony Daley among others. The then-current England Manager Bobby Robson was due to leave his post following the 1990 World Cup in Italy. There was a dearth of English Managers with Title winning credentials. The maverick Brian Clough was aging and in any case would never be chosen due to his confrontational nature. Many clamored for Terry Venables, but he was also seen as too outspoken. Graham Taylor’s feat in achieving a runner-up spot for Aston Villa worked in his favor, as was his reputation for discovering young players. He was Officially offered the appointment in June 1990, however, Aston Villa Owner Doug Ellis somewhat delayed the process, since he felt Taylor was the best Manager in the country. He eventually relented and the 45-year old Taylor was officially appointed as England’s National Team Manager following the 1990 World Cup Finals on July. He was jubilant and honored by the Position, which was the pinnacle for any English Manager. He insisted that “I’d be the most track-suited manager England have ever had”. He appointed Lawrie McMenemy to be his Assistant. England had just had a successful World Cup by reaching the semifinals. Paul Gascoigne had been one of the stars and England was in the midst of ‘Gazzamania’. Two of his discoveries, Platt and Barnes were also part of the set-up; in fact Platt had been one of the revelations of the Tournament along with Gascoigne. The future seemed bright with Taylor expected to build up on the goodwill and the positive displays of the World Cup. Taylor named Gascoigne, Platt, Des Walker, and Mark Wright as the nucleus of a future England. However, not all in the Football Press were as excited. Notable Journalists such as Brian Glanville, knew that Taylor was a proponent of Charlie Hughes’ Long Ball Tactics. Hughes was the Director of FA Coaching and had authored the English FA’s coaching manual. Though, this was necessary in obtaining a diploma as a Manager in England, many believed (Glanville amongst them) that this was outdated and behind modern tactics that stressed passing and keeping the ball on the ground. This was perhaps the origin of the antagonism of the Press with Taylor. 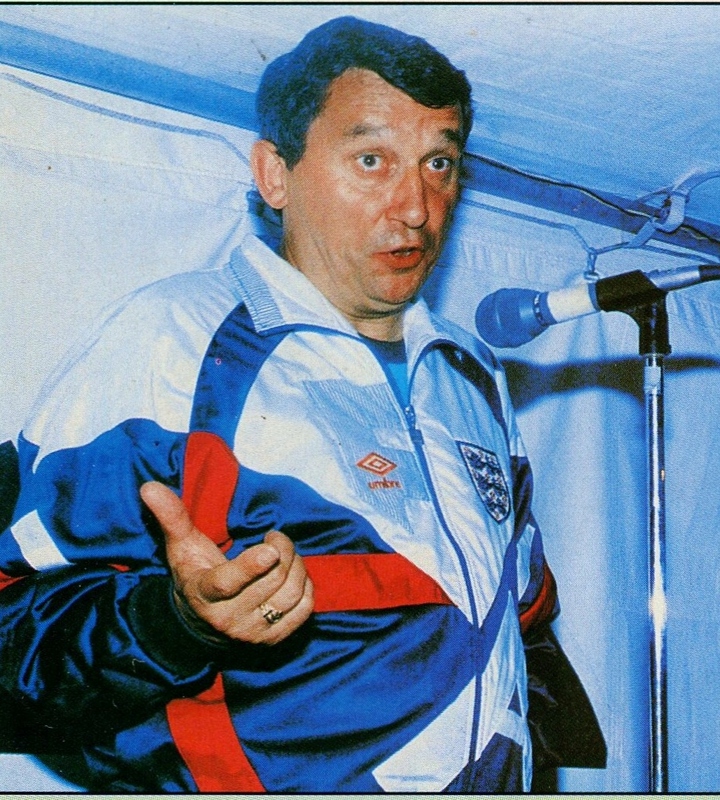 Graham Taylor’s first match in charge of England was a Friendly at Wembley vs. Hungary on September 12th, 1990. It was a beginning of a new era in expectations as well as personnel. Since the end of the World Cup two stalwarts of England had retired due to advancing age. Peter Shilton, nearly 41, had retired from International soccer after nearly two decades. Tall central defender Terry Butcher had also decided to leave the International arena. Shilton’s exit paved the way for his long-serving understudy Chris Woods to finally have his chance as number one. The injury-prone and ageing Captain Bryan Robson would miss this match through injury. In the absence of Robson, Taylor appointed Gary Lineker as Captain. Due to the unavailability of Robson for most of the year, Lineker would essentially be the de-facto Official Captain. Taylor chose to retain most of the squad that had done well in Italy. His main first call-ups were to recall players such as new Arsenal goalkeeper David Seaman. Defenders such as Nigel Winterburn of Arsenal and Gary Pallister of Manchester United were also recalled. The only new debutant would Arsenal outside back Lee Dixon. England won (1-0) in Taylor’s debut through a Gary Lineker goal in the 44th minute. Afterwards the focus was on the UEFA European Championship qualifiers. England were grouped with Republic of Ireland, Poland and Turkey aiming to qualify for the 1992 Euros in Sweden. Poland visited Wembley on October 17th for the first qualifier. This match also gave an indication on Taylor’s future choices. It was becoming clear that the likes of Peter Beardsley and Chris Waddle were being pushed aside. Taylor’s decision to start with Second Division striker Steve Bull of Wolverhampton Wanderers was a clear indication that Beardsley was no longer regarded as a first choice by the new man in charge. Gary Lineker gave England the lead through a penalty kick, but England were certain of the points only when Beardsley (after coming on as a substitute) scored England’s second in the last minute. Taylor’s main area of concern had been the form of Paul Gascoigne, who was being groomed as the central figure in England’s revival. He had been tabloid fodder for some time and his form suffered. Taylor criticized him by saying that England had played with ten men. Issues dealing with Paul Gascoigne would haunt the entirety of Taylor’s reign. His talent was beyond dispute but his discipline especially off the field would remain an issue. In fact for the next qualifier vs. the Republic of Ireland on November 14th at Dublin, he took the then unthinkable step of dropping Gascoigne from the starting lineup. The public reason given was for tactical reasons. 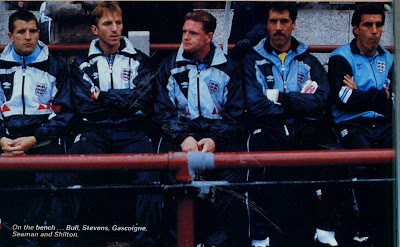 Taylor felt Gascoigne was not suited to the physical battle with the Irish and Steve McMahon would be more useful. He also surprisingly recalled Aston Villa’s Gordon Cowans after more than four years away. For many observers, the discarding of Gascoigne for such an important match was the first step in the Press turning against him. It was obvious that Taylor was not improving the side, but molding England to play the style with which he had succeeded to some extent at club level but was nevertheless unimaginative and uninspiring. As far as the match, the English took a lead through the ever-improving David Platt but had to settle fro a draw after Ireland’s more efficient direct approach and aerial assault led to a headed equalizer from Tony Cascarino (Taylor’s last signing at Aston Villa). The year ended on a sour note for Arsenal skipper Tony Adams. On December 19th, 1990, Arsenal Captain Tony Adams was jailed for four months for reckless and drunk driving. This somewhat compromised his National Team future, but he would be back.